Yamaha Absolute Hybrid Maple drum sets, which won the 2014 MusikMesse International Press Award for Best Drum Set, are now shipping. Yamaha pioneered the construction of hybrid acoustic drum shells when it introduced its flagship PHX Series. As the name implies, the Absolute Hybrid Maple drum set combines a core ply of harder Wenge wood with outer plies of North American Maple. This unique configuration produces a drum with an unusually expressive tone and a wide dynamic range that faithfully reproduces every nuance of a player’s approach. The drums offer a large tuning range, allowing the kits to fit into a wide range of genres for recording and live environments. Absolute Hybrid Maple drum sets feature the original hook lug design, which brings out the drum’s natural tone by creating a small footprint on the shell. In addition to allowing quick and easy head changes, the lugs provide precision tuning. Other features in the series include a new YESSIII mounting system, 3.0mm aluminum die cast hoops, optimized bearing edge shape, piston-drive snare strainer, hinged floor tom leg brackets, a low-mass bass drum bracket and the a new style of bass drum spurs. 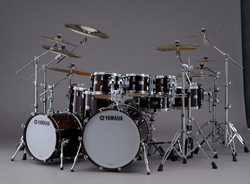 Yamaha’s exclusive staggered diagonal seam and Air-Seal System shell-making process produces strong, consistent shells. Even with the enhancements and upgrades, the Absolute Hybrid Maple sells at a reduced price from the previous Absolute series and offers enhanced value. Yamaha Absolute Hybrid Maple drum set shell packs (MSRP: $5,400 to $7,340). For more information, visit http://4wrd.it/absolutehybridmaple.